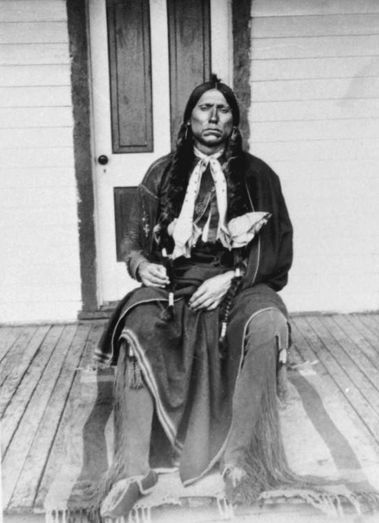 Quanah Parker: Son of Cynthia Ann Parker and the Last Comanche Chief to Surrender. I learnt a bit about him in Apache and Fort Sill, Oklahoma back in 1973. Here I learnt more, thanks to Darla Sue Dollman of wildwesthistory.blogspot.co.za (edited version). Cynthia Ann Parker. Photo taken after she was recaptured and returned to her white family in 1881, shortly before she starved herself to death, mourning the death of her daughter. Quanah Parker’s story is a complicated saga that begins in May of 1836 when a nine year-old girl living in a Texas settlement with her family was abducted during a Comanche raid. Her father was killed during the raid, but her uncle, a nearby rancher, soldier, and state legislator, Isaac Parker, adored Cynthia Ann and insisted the family continue to search for the child no matter how long it took to have her returned. In fact, it took twenty five years. Nine years after she was captured, Cynthia Ann Parker was chosen as the bride to Comanche Chief Peta Nocona. 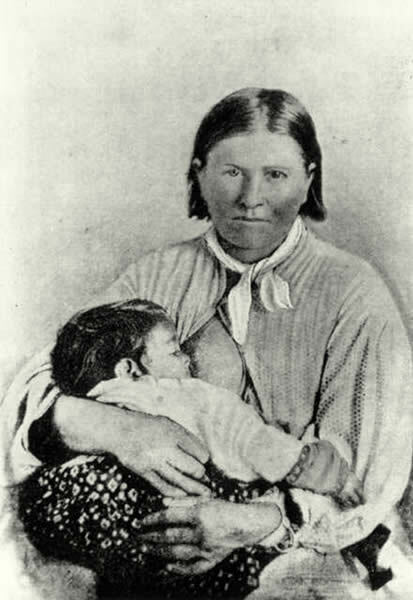 The couple had three children together: Quanah, Pecos, and a young daughter, Topasannah, or “Prairie Flower.” Cynthia Ann Parker was by all accounts a loving wife and good mother, caring for her children at the camp while her husband and the rest of the tribesmen raided Parker County Texas, named after her uncle. In 1860, Nocona’s tribe was camped near the Pease River. The Texas Rangers raided the camp. Peta Nocona and his two sons escaped into the nearby prairie. Cynthia Ann, who wore her hair cropped short, was also wearing robes at the time of the raid and was almost shot by soldiers, but she held up her child to show she was a mother. When the soldiers questioned her they noticed her blue eyes and began to suspect she might be the long lost niece of Isaac Parker. The family gave her a home and some acreage where she could raise her daughter and support herself, but Cynthia was desperate to return to the only family she knew – husband Peta Nocona and sons Quanah and Pecos. She even stole horses in an attempt to return to her husband, but was captured again by her white family who were now her captors. Four years later, little Topsannah died of a fever in her mother’s arms. Cynthia Ann was devastated. Topsannah was the only family she had left. She starved herself to death, mourning the loss of her beloved daughter and her family. It is uncertain when or how Peta Nocona died. It is known, though, that when his oldest son Quanah was 15 he was introduced into the Destanyuka band, where Kobe (Wild Horse) raised him. Quanah Parker, Texas State Library. respected by his people who made him a subchief of the Quahadi (Antelope Eaters) band of Comanche. His anger over the loss of his mother never subsided and it is believed this is why he kept her surname, Parker, for the rest of his life. Prior to his life on the reservation, Quanah fiercely rejected any attempts toward peace made by white politicians. When he reached his early 20s, Quanah started leading raiding parties on his own. When he was 26, Quanah led a daring night raid into the Cavalry encampment of Colonel Ronald Mackenzie, who was actually on a special assignment to hunt Quanah down. Quanah and his men captured many Calvary horses and sent the rest stampeding through the camp. Quanah’s name was now well-known throughout Texas and he continued to lead raids into pioneer settlements, generally driving off the cattle and horses and taking whatever he pleased from the homes of the white settlers. In the spring of 1874, the Southern Plains Indians (Comanche, Cheyenne, Kiowa and Arapaho) recognizing that Adobe Wells post and the buffalo hunters operating from there were the major threats to their way of life on the plains. The held a sun dance seeking guidance. According to the Texas State Library and Archives Commission, Comanche Medicine Man Isa-tai promised victory to the warriors who agreed to fight the enemy–the hunters. On June 27, 1874, Quanah Parker led 700 Indians from combined tribes to attack the post. At that time, there was 28 men and one woman at the post, but they somehow managed to kill 70 of the Indians, who were forced into retreat. It was considered a spiritual defeat for the Indians, and a lesson to the traders as well. In 1848, the traders destroyed the post because they realized its location made it impossible to protect. To the U.S. Army, it was the last straw, prompting actions to defeat the remaining tribes and end the ongoing Plains War. Quanah’s anger could not be appeased. He would have continued to fight to his death, but the Comanche population was dwindling due to disease and war losses, and a low birth rate. One by one, the Comanche tribes agreed to live on reservations. However, the Kwahadi Comanche had never signed a treaty with white men. In fact, they refused to attend the Great Treaty Conference held at Medicine Lodge. They did not trust any treaties proposed by the white men, and rightly so. In the past, just about every treaty signed by the white government was broken by the white government. Quanah refused to surrender and continued to lead his small band of warriors on periodic raids through the white settlements. The U.S. Army used a technique they often used when attempting to subdue the Native American Indian tribes during the Indian Wars–they stole or killed their horses and destroyed all food sources. It was September, 1874. The Comanche, Kiowa and Cheyenne were camped in Palo Duro Canyon on the banks of the Red River. This was viewed as a refuge for local tribes. They had seen soldiers nearby and sensed something was in the works, but they were somewhat unprepared for the attack. When Mackenzie and his men rode through the camps, the members of the three tribes chose to retreat, and Mackenzie responded as predicted–he burned their lodges and food supplies and drove off 1400 horses and mules. Then Mackenzie reconsidered the horse situation and came up with an even more brutal solution. Knowing the loyalty between Indians and their horses–the Comanche referred to their horses as “God Dogs,”–he decided to have the horses and mules rounded up in Tule Canyon and shot. It was an act of cruelty that understandably caused the Comanche intense pain and sorrow. In 1875, Quanah and what was left of his warriors rode into a nearby reservation and surrendered. 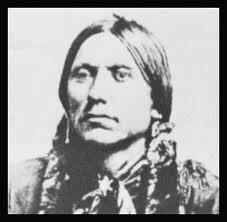 Surprisingly, in spite of his reluctance to surrender Quanah thrived on the reservation. For the next 25 years, Quanah was the leader of the Comanche, and true to his reputation and life example, promoted self-sufficiency and self-reliance among his people. He encouraged the construction of schools and educating Indian children to assimilate with the white culture surrounding them. These actions were not always acceptable to his fellow Comanche, but Quanah could be very persuasive. Quanah thrived in other ways, as well. He promoted ranching on the reservation and, as always, did so by providing an example. He became friends with wealthy cattle ranchers and spent time with his mother’s relatives, the Parker family, to learn successful ranching techniques. 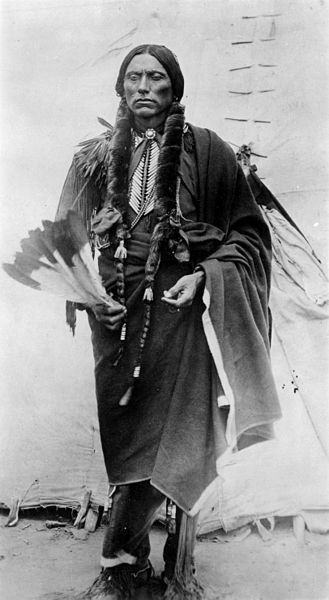 He encouraged the signing of agreements with white ranchers to allow their cattle to graze on Comanche land, yet another controversial move, but he pushed this through by using basic logic–the white ranchers were already using Comanche land and the written agreement showed the Comanche had power and authority. Quanah encouraged the Comanche to build homes resembling their white neighbors, and to plant crops. Unlike the Navajo, the Comanche were traditionally a roaming tribe, following the buffalo, but the buffalo were gone and Quanah recognized the need to change in order to survive. He even approved the establishment of a Comanche police force, yet another wise move that enabled the Comanche to “manage their own affairs”. 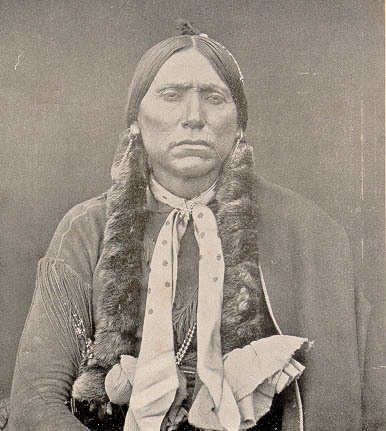 Quanah was sometimes criticized by Comanche for dressing like the white men and assimilating into their culture, but he also surprised the white men with his success. He owned $40,000 in stock in the Quanah, Acme and Pacific Railway and is believed to have been the wealthiest Indian in America in his time. Quanah’s wealth made him popular in white social circles and a popular subject for magazine articles. He was also friends with Theodore Roosevelt. Eventually, Quanah built a two-story eight bedroom house called Star House. He had separate bedrooms for each of his seven wives and his own bedroom. He had 25 children by his eight wives. One of his close friends, cattle rancher Samuel Burk Burnett, helped him pay for it. The house was moved out of the Fort Sill grounds to the nearby town of Cache in an effort to preserve it. Quanah rejected orthodox Christianity, but adopted elements of it in founding the Native American Church movement. Quanah Parker in ceremonial regalia. Photo taken in 1892. Quanah practiced the “half-moon” style of peyote ceremony. He is credited with saying “The White Man goes into his church and talks about Jesus. The Indian goes into his tipi and talks with Jesus.” Quanah and John Wilson, a Caddo-Delaware religious leader are believed to be the reason most Native American and Canadian tribes adopted the Native American Church and Christianity. Quanah Parker was named deputy sheriff of Lawton, Oklahoma in 1902. In 1911 he became very sick at the Cheyenne Reservation from an unknown illness and died shortly after returning home on February 23, 1911. He was buried in his Comanche regalia, beside his mother Cynthia Ann Parker and his sister Topasannah, in Post Oak Mission Cemetery in Cache, Oklahoma. In 1957, the United States expanded a missile base in Oklahoma and moved the graves of Quanah, Cynthia Ann and Topsannah to Fort Sill Post Cemetery in Lawton, Oklahoma. On August 9, 1957, Quanah was once again re-buried in the same cemetery, in a section known as Chief’s Knoll, with full military honors. I shoulda said Gosh! or Darn!